Eternal Stones and Other Memories of Greece! Eternal Stones and Other Stories is the third book by award-winning author, Paula Renee Burzawa. Join her on the journey to a Mediterranean vacation home in southern Greece, where time stands still. 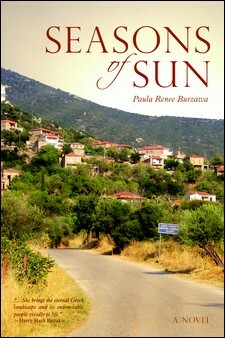 Vacationing in the village of Vassara and delicately balancing life as an American and native, Burzawa’s intertwined essays entertain as she brings readers on the trip of a lifetime, experiencing the ancient marbles of the Acropolis and walking the quiet cobblestone streets hidden away within the mountains of Parnonas. 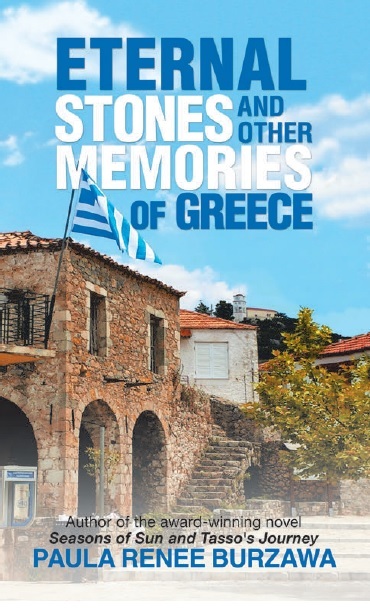 Sharing hilarious and poignant perspectives of her mother’s homeland, Eternal Stones and Other Stories chronicles time spent abroad with renewed reflection, including a quest to locate one of Greece’s secret schools and what happens when a town’s water suddenly stops. From visiting her grandfather’s World War II memorial to a day’s excursion in the charming seaside town of Nafplion and an unforgettable stay at one of the most exquisite, world-famous hotels in Athens, readers are sure to feel they’ve stamped their passports as well, enjoying this modern-day visit to an ancient, magical destination. Told with her funny yet sensitive style, Burzawa’s detailed descriptions are real and true, making Eternal Stones and Other Stories an easily loved vacation treat! Come along on a journey of a lifetime, through the breathtaking hills of Parnonas, outside Sparta, Greece, where the enchanting, ancient village of Vassara awaits your arrival. Your visit begins as the first pages turn of Paula Renee Burzawa's debut novel, Seasons of Sun. This is the story of a magical place, where love and friendship endure through time, where traditions of an ancient world survive modern change. Seasons of Sun, the three time award winning coming-of-age tale opens your heart to discovering life and love in unexpected places. Badly injured, he is near death when two good Samaritans help him get home, but his happy reunion is interrupted when his favorite nephew is stricken with polio even as villagers prepare for an impending attack. Tasso helps the doctors save his nephew's leg and leaves to rejoin his military unit, but he's taken prisoner along with his father-in-law. The Germans take over his family home, bringing unimaginable hardships to his wife and children. After Axis powers surrender, peace is still unattainable as civil war erupts, setting Greek against Greek. 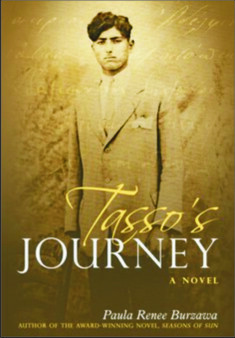 Nothing can prepare Tasso for what is to come, not even victory.